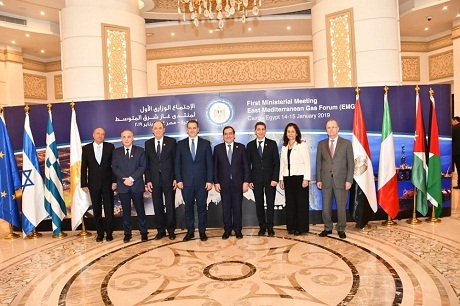 The energy ministers from seven Eastern Mediterranean countries declared on Monday in Cairo the establishment of the East Mediterranean Gas Forum (EMGF), which includes Egypt, Cyprus, Greece, Italy, Israel, Jordan and Palestine, to boost the gas market in the region, a statement by the Egyptian petroleum ministry read. The forum's aim is to have "an international organisation that respects the rights of members with respect to their natural resources in accordance with the principles of international law, and supports their efforts to benefit from their reserves and use of infrastructure." The ministers agreed that Cairo will be the headquarters of the forum. Eastern Mediterranean countries who agree with the forum's interests and objectives will have the right to join along with the founding members. The minister also announced that the forum will be open to other countries or regional and international organisations as observers, and that the forum will work with non-members to help create dialogue, mutual understanding and mutual benefit. They also said that the private sector has an important role to play. During the meeting, the ministers noted that the large gas discoveries in the offshore fields in the Eastern Mediterranean will have a major impact on the energy and economic development in the region. They also emphasised that the increase in new discoveries and their optimal utilisation will have a profound impact on the energy security of the region. The minister also highlighted the need to cooperate in accordance with the principles of international law in the Eastern Mediterranean between the existing and potential gas producers, as well as consumers and transit points in the region, to deepen mutual understanding and awareness of the challenges and common interests in the energy sector between the countries of the Eastern Mediterranean. The ministers also "stressed their commitment to paving the way for fruitful cooperation in the technical and economic fields, with a view to efficient exploitation of the gas potential in the region." The ministers also reaffirmed their commitment to enhancing cooperation and initiating systematic dialogue on natural gas policies, leading to the development of a regional integrated market in a way that maximises the utilisation of gas resources in the region. The ministers called on senior officials to make their proposals about the structure of the forum, which will be discussed by the ministers during the next meeting, scheduled for April 2019. 1. Establishing a regional gas market that serves the interests of members by providing supply, optimising resource development, rationalising the cost of infrastructure, offering competitive prices and improving trade relations. 2. Ensuring supply for members while working on optimal resource development and the efficient use of existing and new infrastructure with competitive pricing and improved trade relations. 3. Strengthening cooperation by creating systematic dialogue and formulating common regional policies on natural gas. 4. Deepening awareness of the interdependence and benefits that can be derived from cooperation and dialogue among members, in accordance with the principles of international law. 5. The current owners of gas reserves and existing producers in the region are working to capitalise on their current and future reserves by enhancing their cooperation with the parties of consumption and transit in the region, taking advantage of existing infrastructure and developing more infrastructure options to accommodate current and future discoveries. 6. Assisting consuming countries in securing their needs and allowing their participation with the transit countries in the development of gas policies in the region, thus enabling the establishment of a sustainable partnership between the actors at all stages of the gas industry. 7. Ensuring sustainability and environmental considerations in gas discoveries, production and transportation, building infrastructure, and improving the integration of gas and other energy sources, especially renewable energy and electricity networks.